What is a noun? 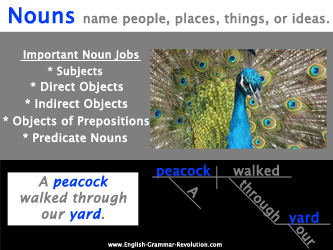 Learn what nouns are and what they can do. Hello! I'm Elizabeth O'Brien, and my goal is to get you jazzed about grammar. Everything that you see, you can name. Each of those names fits the above definition. What do you see? A computer, the living room, your dad, a swan... You don't see a swan? You will in a moment. Before you commit the above definition to memory, I would like to clarify one thing. Nouns are words that name people, places, things, or ideas. They are not actually people, places, things, or ideas. After teaching grammar for some time, I was surprised at how many of my students weren't really clear on the whole "word" thing. Allow me to make this clear. What is a noun? Choose the noun from the following two pictures. If you guessed that the one on the left is a noun, you are correct. Why? Well, what is a noun? It is first and foremost a word. 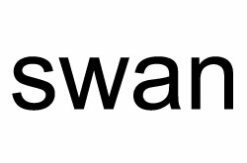 Notice that while the image of the swan is the cuter of the two, it is not naming a swan. 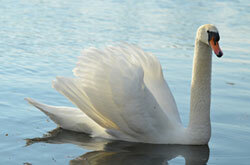 It is a swan. Does that make sense? A noun is a word, not the actual thing that the word represents. It's kind of cool, huh? Now, your task is to memorize the following definition. Nouns are words that name people, places, things, or ideas. Put on your memorizing cap and stick that sentence in there. Nouns can do lots of things in sentences. They're probably the most overworked of all eight of the parts of speech. Nouns have the ability to perform different functions, or jobs, in sentences. Each time a noun is performing one of these jobs, it still fits the answer to the question, What is a noun? Let's look at some of the noun jobs. 1. Subjects are nouns that tell us whom or what a sentence is about. 2. Direct objects are nouns that receive the action of certain kinds of verbs (transitive active verbs). 3. Indirect objects are nouns that receive the direct object. Mrs. O'Brien taught the class grammar. 4. Objects of prepositions are nouns that come after prepositions in prepositional phrases. The class found a dog at the park. 5. Predicate nouns ("predicate nominatives") are nouns that rename the subject. They come after linking verbs. 6. Object complements are nouns that complete the direct object. The class named the dog Rex. 7. Appositives are nouns that rename other nouns. My friend Marianne likes cupcakes. So, how's it going? Am I confusing you? If you feel overwhelmed, don't worry. Just keep reading and working. You'll get it. Once you start diagramming, you'll know all of this stuff without even trying too hard! You should check out sentence diagramming if you haven't given it a shot yet. Sentence diagrams SHOW you how nouns act in sentences. Do you like apples? I hope so; they're good for you! Well, as you know, there are many different types of apples (Granny Smith, Golden Delicious, Gala, McIntosh). Each kind of apple tastes a bit different, but each is still an apple. Nouns are similar, only they don't taste as good. Whichever type you're dealing with will have its own characteristics, but they will still be nouns. That means it still fits our answer to the question, What is a noun? (a word that names a person, place, thing, or idea). Are you ready to hit me over the head because you're so tired of me repeating that? Good. Hopefully that means it's stuck in your mind. Here are the different ways to describe or classify nouns. If you would like a more examples of each, click here to see a list of nouns. Note that nouns can fit into more than one of these categories. For example, the word cat is a common, concrete, countable, singular noun. • Common: These name general, nonspecific people, places, things, or ideas. They start with a lowercase letter unless they begin a sentence. • Proper: These name specific people, places, things, or ideas. They always start with a capital letter. • Abstract: These are the opposite of concrete. They name something that you cannot perceive with your five senses - something that does not physically exist. • Concrete: These name something that you can perceive with your five senses - something that physically exists. • Countable: Yep. You guessed it. These can be counted, and they use both the singular and the plural forms. Anything that you can make plural is a countable noun. • Uncountable: These guys cannot be counted. Since they cannot be counted, they only use the singular form. • Compound: These are made up of two or more smaller words. • Collective Nouns: These are singular nouns that refer to a group of things as one whole. • Singular: These refer to one person, place, thing, or idea. • Plural: These refer to more than one person, place, thing, or idea. They generally end with an s.
• Possessive Nouns: These show ownership. Don't get too bogged down by all of those definitions. Know that they exist, but don't worry about committing all of that to your memory. This video made me laugh. If you don't want to teach or learn grammar by yourself, click here to see how I can help you. [Get Smart] is easy to use, and any time I can get kids and teens interested and saying, "This is fun!" when we diagram, I'm thrilled! If you want to teach or learn grammar the easy way, follow our step-by-step program that clearly lays everything out and allows you to move at your own pace. The Get Smart Grammar Program is presented in a logical sequence, so it's not an overwhelming mishmash of information. Just watch the videos and complete your assignments. Before you know it, you'll be a grammar and sentence diagramming pro! Quick Refresher: What is a noun? A noun is a word that names a person, place, thing, or idea. Identify the nouns with this PDF worksheet. Elizabeth O'Brien is the creator of Grammar Revolution. Copyright © 2009 - 2019 Grammar Revolution. All Rights Reserved.